You won’t believe this Dining Room Update! My client was very pleased with the outcome in this quick update. The couple was happy to get such a dramatic transformation by simply switching out the valance with a newly designed window treatment. In today’s post, I’d like to share a recent project I’ve been working on for one of my lovely interior design clients. This particular client wanted a quick update to the dining room, but with none of the upheaval felt in a total renovation. There was an existing wallpaper and paint combo which the couple did not want to change, and there were dark custom window treatments that had been installed approximately 20 years ago, when the following look was the height of fashion. As you can see, the dining room is very traditional with a lovely turquoise paint above the chair-rail and simple darker-teal striped wallpaper beneath. Dark burgundy paisley swags and long cascades feel heavy on this pretty bay window. The client also wanted to switch out the striped fabric on the dining chairs, glimpsed at the bottom left in the photo. Of course, I would have loved to start from scratch in this dining room…that’s always fun and there would be so many wonderful options for this beautiful space. But since the clients wanted to stick with their current wall finishes for the time being, I happily accommodated. So I proposed we remove the dark, heavy valance and introduce lighter, en-trend fabrics along with a more streamlined window treatment design. I sketched out a new custom valance, featuring curving flat sections (to show off the pattern of the fabric) with horns placed between each scallop. Tailored, shorter cascades were included at the outsides, and full-length drapery panels in a wispy ivory embroidered fabric were used in the corners to soften the whole look. I knew these light drapery panels would not only take the edge off all the angles, but would also provide a longer, leaner line in the window alcove. These panels would have the power to draw the eye upward, while brightening things up in the room at the same time. After presenting three fabric options for the window treatments, and a couple of choices for new dining chair seat upholstery, the clients made the following selection for their new dining room treatments. Fabrics selected were lighter and more updated in their color palette. 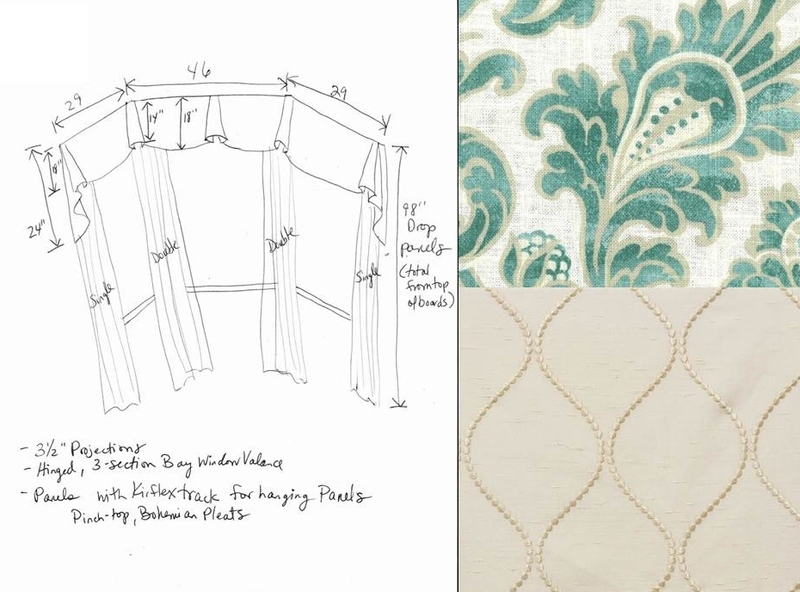 My sketch of the window treatment design shows full length panels in a wispy light fabric, and less cumbersome valances with a more tailored vibe. The beautiful new treatments make all the difference in the world, don’t they? NOTHING else has changed, except the window treatment and chair seats. The light and airy drapery panels are fabricated using an off-white embroidered fabric to lighten the space. 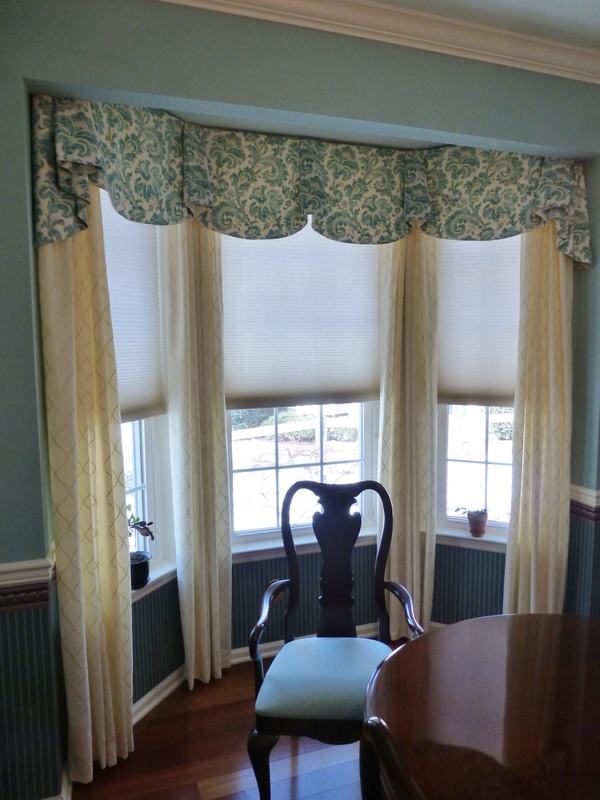 The valance is a custom design using a lovely scroll-printed linen, and the chair seats are covered in a textured dotted solid. All the fabrics in this project were purchased from Stout Brothers, a favorite supplier of Robinson Interiors. I think the new window treatments make such an impact on this room, don’t you? Before: the dark fabric and heavily swagged & tailed window treatment darkened the room and made everything feel dated. After: the fresh and light fabrics, and more elegant, streamlined design makes this room feel fresh and open. What a difference! 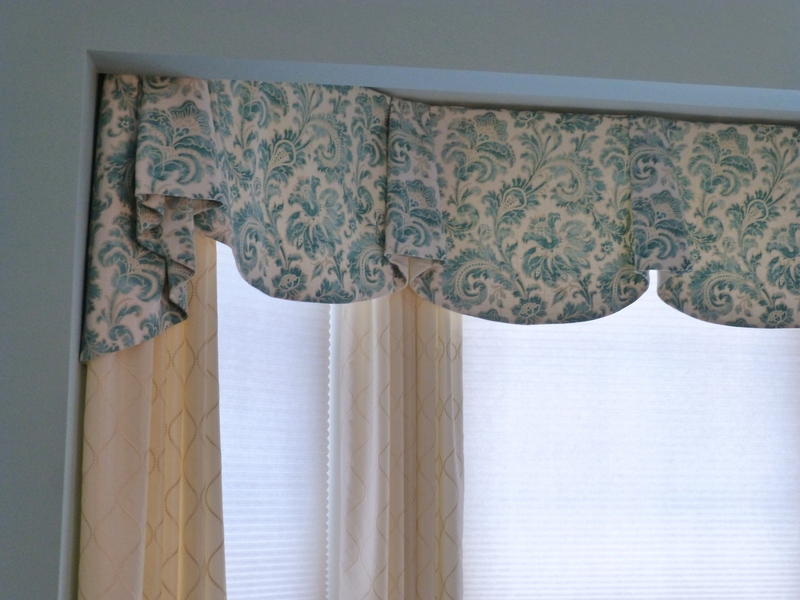 A closeup of the very pretty window treatments in my client’s updated dining room. My client was very pleased with the outcome in this quick update. 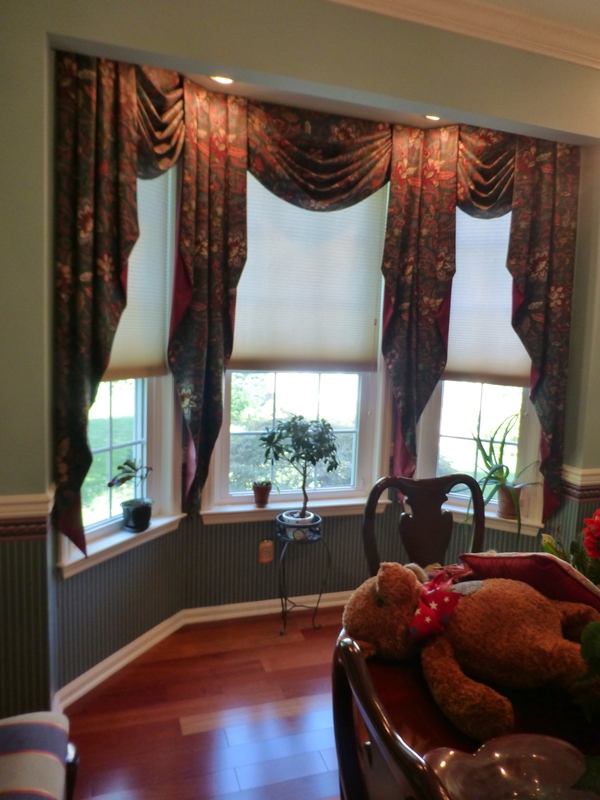 The couple was happy to get such a dramatic transformation by simply switching out the old, dated valance with a newly designed window treatment. Often, such a metamorphosis can be made by adding new colors, patterns, and fabrics along with a new style of treatment. 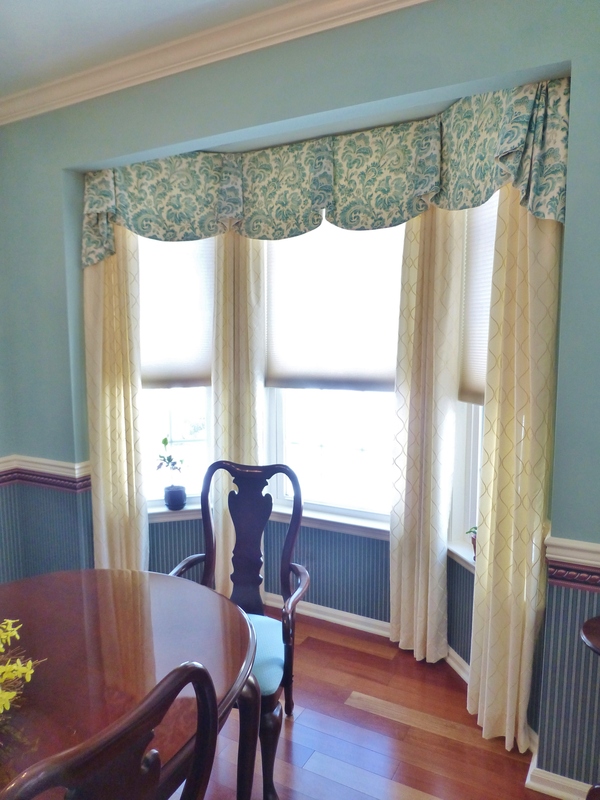 A final look at this finished bay window treatment. If you’d like to set up a consultation for a quick refresh and update of rooms in your own home, feel free to call or email me. I’m just full of innovative ideas for rejuvenating tired interiors and I absolutely love sharing that vision with my fabulous clients! Until next time, please tell all your friends about Kristine Robinson’s Interiors…I need all the friends I can get! 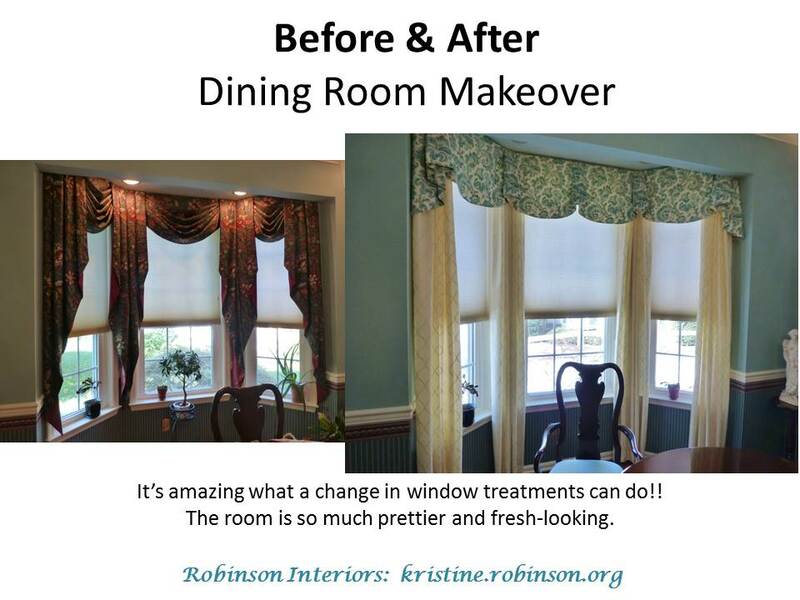 This entry was posted in Draperies, Home Decor, Interior Design & Decorating, Robinson Interiors, Update and tagged Bay Window, Curtains, Decorating, Dining Room, Fabrics, Kristine Robinson, Refresher, Stout Brothers, Teal, Turquoise, Valance, Window Treatments. Bookmark the permalink. Hi Kristine…what a beuatiful new look your client has…love the new fabric choices. Much lighter and fresh looking. Thank you so much for linking up to Share Your Style link party! You helped to make our first party a big success! PS…Noticed you are based in Jenkintown, I grew up right next door in Glenside! Thanks again for hosting. So nice to hear from a fellow Philadelphia gal! Oh, I love what you did with the new window treatment! Love the the pretty fabric you’ve used The style is lovely too!